Some interesting python in an ancient physics engine teenage me wrote: magicsouljar=system.FillStateVector() try: system.checkLegality() except: return 0 system.FillFromStateVector(magicsouljar) And no, the questionable variable isn't referenced anywhere else, I checked. Granted. Your family name is changed to studmuffin, and you retroactively have to endure the comments about your mom, Mrs. Studmuffin, thorughout middle school. I wish I could mentally control the voltage across my right thumb and index finger. Intuitively I feel like for any continuous functions f and g where f>g on an interval [a, b] there exists a finite degree polynomial p such that f>p>g. However, I'm not sure how to approach a proof, or even whether my intuition is right. Does anyone have a hint? However, I can't manage to prove it more formally than 'well its true because pi is irational.' Any tips? Depending on the implementation of the problem, you could multiply two large primes and ask both for the factorization of the result, whichever can answer instantly is the truthteller. Topic: The answer is slimy. Re: The answer is slimy. It's easy to forget that everyone in this subforum is 2000% genius. sorry about the pointless thread. It's been bugging me for a while to keep seeing htis in the news and not really understand it! Of course, given quantum physics is involved I probablyam still only scratching the surface, but it's a big improvement! thirdparty got it, in the future I think i need to be more careful in my handwriting when doing cryptography! Today I learned that unsurprisingly, Mercury (I) fluoride is a terrifying chemical. Basically, if you super-cool water and hit it with a radio-particle, will it nucleate ice formation? Will it do it in such a way that the path of the particle can be discerned from the resulting ice? Why did Euler get famous for looking in his toilet? he found a natural log. So, does it take more force to accelerate a rotating disk along it's axis than a non-rotating disk? I would like to point out that the FE'ers just caused a (minor) religious flame-war in a different forum in a thread that none of them have ever posted in or even know exist. Trolls of the FE forums, my hat goes off to you. You will never know the extent of your victory. Re: 0962 "The Corliss Resolution"
Also, this comic reminded me of this: Kiwi. I had almost gotten over the depression from watching that video the first time. When I was first told this, it took three people and a trip to wikipedia to convince me I wasn't being pranked. I've mostly graphittied with goggles. 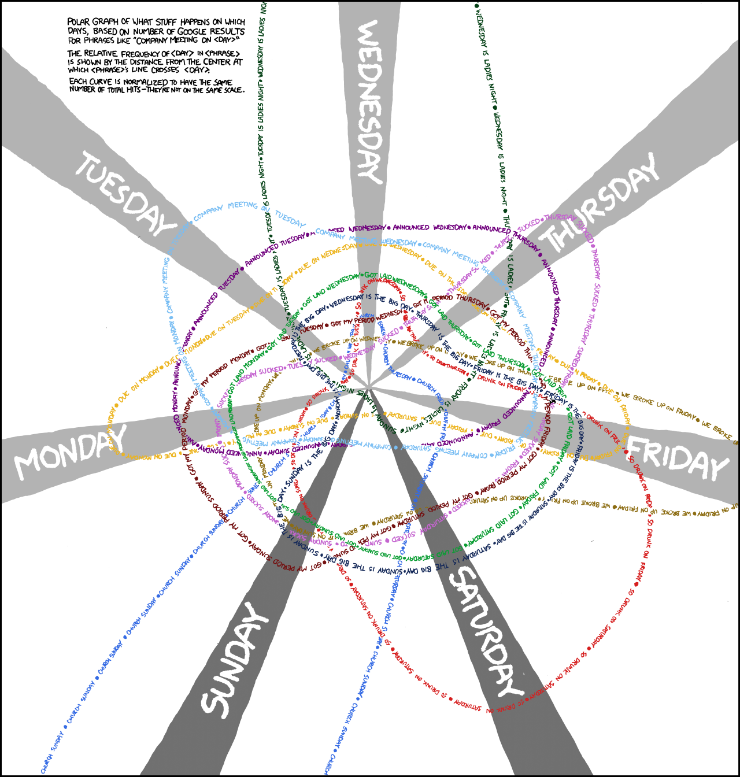 0930: "Days of the Week"
Not pictured: the elongated Halley's-Comet-like orbit of every Rebecca Black lyric. Well, that was over quickly. Re: 0657: "Movie Narrative Charts"
If anyone here has read Homestuck and is interested, we're starting a chart for it here.